Tonight, the Age of Alexander came to an end 205 Live kicked off with a party!! With Tony Nese finally ridding himself of Buddy Murphy, the Cruiserweight Champion looks to find his next challenger. Tonight, we also bid goodbye to the Soul of 205 Live, Cedric Alexander. The former Cruiserweight Champion was drafted to Monday Night Raw during the Superstar Shake-Up last night, taking him away from the brand that's been his home for nearly three years. In his final match on the Purple Brand, he'd face off against the Star Destroyer, and 205 Live's new brawler, Oney Lorcan. 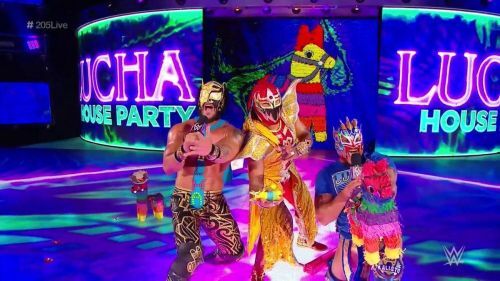 We started off the show, though, with action featuring the Lucha House Party's Gran Metalik, Mike Kanellis, Akira Tozawa, and a new and improved Ariya Daivari. Daivari has been on a rampage after abandoning Hideo Itami back in January. With a new mean streak, he looked to prove himself as an adequate #1 contender to Tony Nese's Cruiserweight Championship. Mike Kanellis also picked up a big win against Akira Tozawa recently, and though he lost the second match, looked to be on track for a great 2019. More aggressive than ever, Kanellis, accompanied by his wife Maria, has gold on his mind. Daivari quickly abandoned the ring, allowing Metalik and Tozawa to take on Kanellis two-on-one. With Kanellis out, the two squared off. Metalik dizzied Tozawa, tossing him around the ring with rope assisted manoeuvres. However, a leaping hurricanrana from the top sent Metalik outside. Before Tozawa could capitalize, Daivari levelled him with a clothesline. Metalik rocked Daivari with a springboard dropkick. Kanellis came back in for revenge, but Metalik escaped, taking both he and Daivari out with a crossbody. As he made it back to his feet, he was locked in the Iron Octopus by Tozawa. It didn't last long, though, as Daivari and Kanellis delivered superkicks in stereo to the two men. Daivari left Tozawa knocked out in the corner while Kanellis dropped Metalik with a suplex. Daivari then continued the beatdown on the King of the Ropes with a series of mounted punches. Daivari launched him into Kanellis, who spiked him with a deadly Double A spinebuster. They looked to work over Tozawa together, but the former champion dodged Kanellis's superkick, which caught Daivari instead. With Daivari and Metalik outside, Tozawa and Kanellis went to work. A Michinoku Driver nearly gave Kanellis the win, but he was yanked out of the pinfall by Daivari. Kanellis attempted to get back inside but was driven through the floor with a powerbomb. Back inside, Daivari went for the wristlock lariat, but Tozawa countered with a spinning roundhouse kick. Metalik, now fully recovered, avoided Tozawa's kick and dropped him with a unique facebuster. Kanellis sent Gran Metalik outside but was taken out by a shining wizard from Tozawa for his troubles. Tozawa rocked him with a missile dropkick. However, he couldn't capitalize, as Metalik connected with a springboard senton bomb. Before he could move, Daivari connected with a frog splash. Metalik kicked out. Metalik left Daivar stunned on the apron with an enzuiguri, then followed up with a leaping hurricanrana, launching Daivari into Mike Kanellis on the outside. Tozawa found himself alone in the ring and took out all three men with a suicide dive. He brought Kanellis inside, who escaped a German suplex attempt. Several elbows and chops forced Tozawa to release his hold. The two men stood in the centre of the ring and traded chops. Tozawa got ready for a big chop, but Kanellis ducked, and when he looked up was rocked by a right jab. Though Kanellis responded with a boot, he was dumped on his head with a German suplex. Tozawa went up top for the Senton, only to be distracted by Maria. Kanellis met Tozawa at the top to prevent the Senton. Though he was knocked off the top, Kanellis countered Tozawa's biggest weapon and planted Tozawa with the swinging facebuster. He avoided a springboard elbow drop from Metalik, who landed on Tozawa. Kanellis tossed him outside. However, he wasn't able to pick up the win, as Daivari then sent him outside as well, pinning Tozawa for the win. Results: Ariya Daivari defeated Akira Tozawa via pinfall. 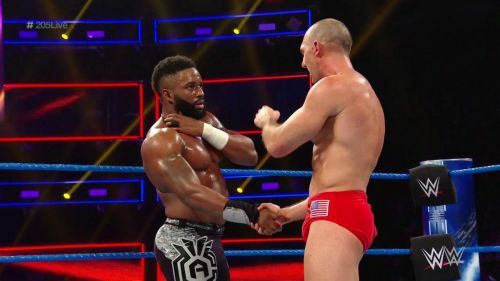 Backstage, Oney Lorcan praised Cedric Alexander for leading 205 Live and the cruiserweights over the past few years. He said that he respects the Soul of 205 Live, but wants to become the next leader, and if he couldn't beat Alexander, he didn't deserve to be here. Alexander responded with his own backstage promo. He stated that, though he was leaving 205 Live, he's still the gatekeeper of the division. Tonight, he looked to leave the brand on top.